Knocking someone out is an art, not a science. You have to get just the right combination of strike, angle, target and timing for it to work. You might clip one person with a glancing blow and have them go down instantaneously, lights out. But then, another time, you might hit someone else square on the jaw with your very best Sunday punch and he’ll just stand there and smile at you (uh-oh, better start running)! But it’s not all luck. The more you understand about the anatomy of human body then the more often you’ll get the fight-ending big KO! Today we’re going to look at the 3 best targets on the human body to knock somebody out. The video below breaks it down for you with lots of examples of actual knockouts from the boxing, MMA and Muay Thai ring. Please note that we’re not including targets on the body below the neck in today’s article. Although shots to the body can also end a fight (and a good liver shot is so painful that you wish you were unconscious) it’s very rare for someone to get knocked unconscious from a body shot. The jaw is the easiest knockout target to access, because it’s the biggest of the 3 targets we’re going after. 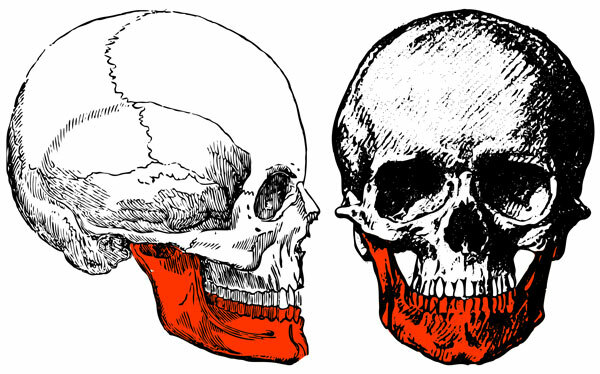 Doctors and anatomists debate the exact mechanisms by which a shot to the jaw causes the brain to shut off. It may, for example, have something to do with the jaw acting as a lever and amplifying the force transmitted to the head and the subsequent rotational ‘sloshing’ of the brain. But regardless of the mechanism we can all agree that shots to the jaw have knocked out countless fighters in the boxing, kickboxing and MMA ring. And if you watch enough streetfights you’ll see that the pattern is no different on the street. The jaw is a huge target and hitting it hard with a fist, elbow, knee or kick can bring the fight to an abrupt end. The temple area is just behind your eyes and alongside the zygomatic bone on your face. If you reach up with your hand you’ll be able to feel the indented area corresponding to the red highlights in the image below. The temple is a smaller target than the jaw, but no less effective. I’ve heard several different explanations for the vulnerability of this area, including from the relative thinness of the bone in the temple, the biomechanical effects of lateral and rotational acceleration of the brain, to b.s. Chinese acupuncture point locations. For our self defense purposes the exact mechanism is unimportant: the bottom line here is that if you get hit hard here it’s probably lights out! The third point we’re going to talk about today is the side of the neck. More specifically it’s about halfway down the neck on (or under) the sternocleidomastoid muscle (the big ‘rope’ that goes from your ear to the front of your neck). This target is less commonly seen in boxing because the big gloves make it harder to access this point, but you see it fairly frequently in MMA, kickboxing and stick fighting when someone targets the head or the neck. The side-of-the-neck target also corresponds to the brachial stun location used by a lot of the Dim Mak and pressure point knockout people. In fact the brachial stun may be the only legitimate thing these charlatans do: hitting 3 different meridian points on the bladder meridian (or whatever the magical sequence of the day is) never seems to work on a resisting opponent, but if you whump somebody hard enough on the side of the neck they’re going to get wobbly and fall down. I’ve heard doctors debate whether it’s a vascular (i.e. blood-based) or neurological (nerve based) knockout. The knockout point does correspond well to the location of the Carotid Sinus, which your body uses to keep track of blood pressure, so it may well be that hitting this point tricks your body into thinking that your blood pressure is sky high and shuts your brain off as a protective mechanism. Once again, it doesn’t really matter why it works. The fact remains that it’s incredibly effective. The knockout is glorified in combative sport. Every highlight reel for the UFC features fighters being laid low by a photo opportunity shot to the head. Knocking somebody out in the ring is one thing. Your opponent is landing on a padded surface and they’ve signed disclaimers and liability waivers to get there. But on the street the first shot that knocks your opponent out could very easily be followed by a skull-crunching impact of head on sidewalk. This second hit – the head bouncing off the pavement – has tremendous legal and ethical considerations. People have been sent to jail for more than 10 years after a simple sucker punch was followed by such a pavement coup de grace. To familiarise yourself with this often-overlooked but potentially life-altering danger please check out the ‘Death After The Knockout (Or Beware the Second Hit)’ article on this site. And if you want to receive our self defense tips by email please enter your email address in the box below. It’s all good stuff and if you don’t like it you can easily unsubscribe with a single click at any time.